Dope Folks’ 90th release comes from the vaults of The Beatnuts' own PSYCHO LES! 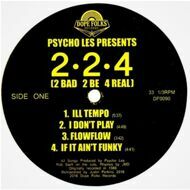 Formed in 1988, 2*2*4 (2 BAD 2 BE 4 REAL) consisted of Psycho Les, JMD, Universal and cuts by Rob Swift. 2*2*4 only released one single back in 1988 ("ILL Tempo" b/w "I Don't Play") and that was it... until now! Psycho Les has gone through his DATS to find the demos that would've made up their full-length album. This 12" features both tracks from their only official release, and 6 previously unreleased tracks! Straight from the DATS of Psycho Les, these are the only existing tracks of the group! Dope Folks did their best to clean up these raw demos to compile an 8-song historic document that kicked off the careers of Psycho Les, and Rob Swift! Limited to 350 copies (50 colored vinyl, 300 standard black) and never to be repressed. This is the BLACK VINYL version.